Nigerian government, which has done nothing for the Biafran people in terms of infrastructural development and youth employment is currently, seriously looking for excuses to kill Biafrans. The government is planning to do this just to divert attention from the emptiness and incompetence of their illiterate President, Muhammadu Buhari, who has thrown the country into recession since he accessed power through a hugely rigged election in 2015. Buhari is simply sore because Indigenous People of Biafra (IPOB) has exposed his hopelessness in running the country, having opened the eyes of the people to the lies and shenanigans going on in Nigeria in the name of governance. This short article culled from Same Okoro’s Facebook wall, shows a reason why Nigerian government is actually becoming apprehensive about what is going on in Biafraland. Steadily, IPOB is endearing itself to the hearts of the people. It is inching closer by the day. 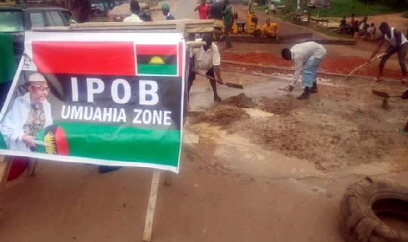 IPOB now repairs federal roads in Igboland. From the look of things, the people should expect more infrastructural and welfarist interventions from the Biafran global body. Nnamdi says IPOB is in over 100 countries and is a very wealthy organisation, and the holy book says; "money answereth ALL things". If Nnamdi Kanu's IPOB’s fiscal budget matches 30 per cent of Nigeria’s central government budget in Igboland, and be certain there is no corruption in this enigmatic and youthful zeal led organisation; if they muster and spend 30 per cent equivalent of Nigerian central government’s budget in Biafraland for a few years on development projects, federal government will soon be out of Igboland officially. Then, things will begin to shape up. The ill-advised speech of the unlettered ailing one, only pointed to how worried he, and his government has become about IPOB. They are really rattled. A national broadcast from a leader returning after 106 days, squarely focused on Nnamdi Kanu, meant that Kanu is on his mind 24/7. Nnamdi Kanu and IPOB are fully loading and the Biafrans can't get enough of him. He has smartly turned unemployed Biafran youths into perhaps the largest singular multipurpose volunteer force (workforce) in Africa and the world today. Be certain that projects and activities will be rolled out to keep them busy; their spirits and morale are constantly octane pitch high. This is Drama in our lifetime. Let me say it here; there is ABSOLUTELY nothing anyone can do to keep Nigeria together if IPOB remains determined in this format. Not the Fulani military constitution; not the corrupt and rotten Nigerian government; and certainly not the British government battling with its own multiple breakups, can stem this rising tide.